I heard a rumor about a month ago that the Wigshoppers may want to recruit me. My nerd alarm started sounding. The past year of my life has been spent in part perusing the pages of the Wigshop blog while getting my start as a photographer. I can't blame my lack of early photographic stardom on the Wigshop but wonder how many hours I have invested as a reader. It feels good to be a writer on the (second) Best Blog in Knoxville! I graduated from the University of Tennessee last December with a business degree in logistics. Despite the good job prospects for a young logistician I decided to pursue my other love, photography. You will probably see me around town with a camera and some lighting gear at some point. That is, if you don't see me reading the Wigshop first! You will also begin to see more photos of our great little city on this blog. That is why I am here. 1. Sports: Yes I said it. I'm a UT sports fan. I grew up spending my Saturdays at Neyland Stadium looking up in awe at the size of the place while singing Rocky Top. In college and even now, I make part of my living photographing UT football and basketball. It is fun and I couldn't ask for a better way to spend my weekends. 2. Food: Somewhere there is a statistic that says Knoxville has more restaurants per capita than any other city in America. I can believe that. Whether stuffing my face at Nama, Silver Spoon, Tomato Head, La Costa, Pasta Trio, Barley's, Naples, The Orangery (not on my dime! ), Long's Drug Store, Soccer Taco, etc. I will never feel the need for a great place to eat. Knoxville knows where it's at when it comes to food. Next stop, Chandler's. 3. Venues: The Bijou Theater, Tennessee Theater, Market Square, Barley's, World's Fair Park, World Grotto, WDVX Blue Plate Special and a few others have one thing in common... they are all great places to catch a show. It doesn't matter if I am looking for the everybodyfields or some Shakespeare on the Square, I am never disappointed. If I had all the money in the world I would spend most of my evenings at one of those locations. 4. Beer: With the advent of the Knoxville Brewers' Jam just on the horizon I can't help but think about beer. Knoxville is a great place to grab a pint (or whatever measurement you prefer). Crown and Goose, Pres Pub, Downtown Grill and Brewery, and Union Jacks are a few of the great places to grab a beer. Many memorable (and not so memorable) nights have been spent on the back porch at Barley's. Oh and I can't forget about the newest place to quench your thirst, The Skybox at the Sunsphere. aka Wigshop HQ. 5. Revitalization: I know that this topic has been discussed at length on this blog, but I have to mention it. I'll keep this one short by saying that I'm very excited to see what downtown will look like in 10 years. Now you know me. Oh and Max is a pseudonym if you have not caught that yet. It stems from the place I like to call "Heaven on Earth" (aka Max Patch) up there on the border of Tennessee and North Carolina. The photo above is from Max Patch. And if you are interested here is some other stuff I do. So there ya go. Lately, I've noticed that Barley's is booking some truly awesome bands. Two weeks ago, Lord T and Eloise packed the place; and just last night I was lucky enough to see one of my favorite bands The Felice Brothers ohsoclose. The Felice Brothers are phenomenal. They're sort of folk rock with tons and tons of energy. Their songs can be funny, harsh or impactfully sentimental (sentimentality at its best). And they rocked that show last night. A.A. Bondy opened for them. I had never heard him live, and I am so glad I did. He is freaking incredible. I mean, he is amazing. NPR has a story on him (music included) that you should check out. I like seeing bands at Barley's because it's still a bar. (And it generally only costs 5 dollars to get in). You don't have to stand there and feel like you have to stare at the band the whole time. You can get a beer and talk if you want. But you can also watch the bands like I did last night, in an enamored sort of way. So the moral of the story is that recently, Barley's has been hitting it out of the park. I hope they continue to do so. They've got a billion great beers too. Josh Flory got the scoop in the Scope about a new mini-market in World Grotto. You can buy milk, canned foods, etc and it's all on market square. It's been open for a little under a month so it's no wonder i've missed it... plus there has been no PR for it. has anyone bought anything from here? The prices seem a bit high, really high, but at least it's still convenient. here are some of his pics of it. The HoLa Festival at Market Square, Saturday, 11 a.m.-8 p.m. It's a festival to showcase Hispanic culture, traditions and heritage. There will be food, music and children's activities. More information at the Hora Hora Latina website. FYI: There's NO farmers market this weekend. The 8th Annual Neighborhood Bike Ride, starts at Market Square, Saturday, 10 a.m. The annual bike ride visits North Knox, including Emory Place, Fourth & Gill, Edgewood Park, Fairmont & Emoriland and Oakwood/Lincoln Park neighborhoods among others. The Big Read, Wednesday, noon-1 p.m. This is an initiative by the National Endowment for the Arts to make reading a larger part of American culture once again. The Big Read will offer community discussions about a particular book, and this year it's John Steinbeck's Grapes of Wrath. Knox County kicks off its Big Read during Wednesday's farmers market. Local important people will be there, the Tennessee Children's Dance Ensemble will perform and the first 75 people will receive a free copy of the book. Don't forget that next Friday is First Friday and the Movies on the Town selection will be Napolean Dynomite. Anything I'm missing that should be included? Let me know in the comment section and I'll update the post. Knoxville Talks used to be an everyday web stop for me. Katie Allison Granju built it up into one of the better local news blogs in the Knoxville blogosphere, constantly updating with viewpoints of life in our city. But now she's gone, and Knoxville Talks is no longer talking. In her last post, Katie said that she was "leaving us in the capable hands of WBIR." Well, it seems that WBIR and can't even keep up one of its flagship blogs. Despite KAG's boosterism, WBIR's blog efforts seem half-hearted and are easily being outclassed by both the community that the News-Sentinel has built and the style of Knoxville Voice. Knoxville Talks was easily the best part of WBIR's web presence- I think it's a real shame they've let it lapse. 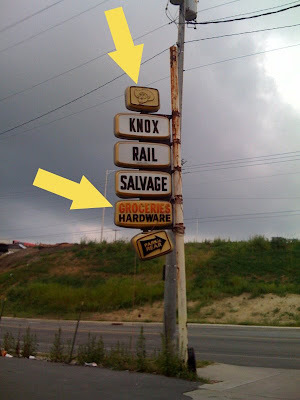 Update: Looking around a little more, I found Granju's new blog at, you guessed it, knoxnews.com. I spotted a new business on Market Square the other day and stopped in this morning to check it out. 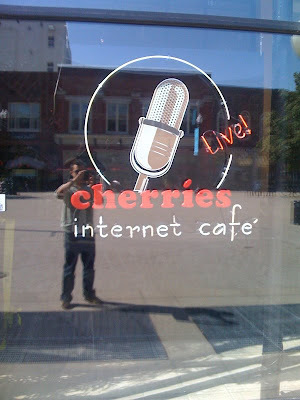 Cherries Internet Cafe is tucked underneath the Chamber of Commerce at No. 17. Is that a television studio?! And the kiosks look more like bar booths with screens. The interior design is pretty slick, in my opinion a must if you want to become a destination spot for downtowners. So far, better than expected. I introduced myself to Jessie, the Technology Manager there. She led me around and explained the many things Cherries is trying to do. The key word I think is "Community." They want to bring people together digitally and in real life. By having a presence on the internet and a real life location, Cherries could become the physical hub for what already happening digitally in the blogosphere, forums, ect. They plan to have a "Tea Bar" in the front, providing an alternative to all the coffee shops in downtown. The Lunchbox will be providing food for sale at lunchtime. Each booth has dedicated headphones, iPod/iPhone chargers, keyboard, and adjustable screen. Importantly, I want to point out, the booths seat four people, as in "have fun doing digital stuff together, not isolate yourself a gaming world" kind of attitude. You can bring in your laptop for free wi-fi too, if you want. But what's up with that glass studio? 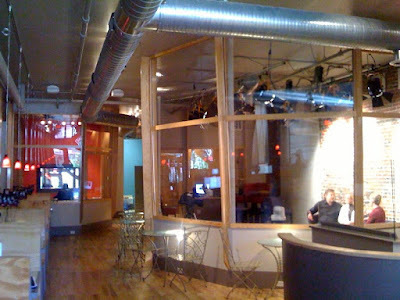 Cherries is also a multimedia company, and streams programs generated in the cafe itself out to the internets. Think of it as public cable access in the digital era. Anybody can sign up and make a program (subject to quality control from Cherries) and have access to professional equipment and facilities (for a fee, of course). The current set of shows are just starting out (and are a bit bourgeois in taste) but the idea is sound. As word spreads, a more diverse set of voices and aesthetics should emerge. Hopefully a Knox version of Wayne's World will hit the interweb soon. So go check it out. They're slated to officially open on the 25th, and the "Daisy Pot Tea Bar" will start going next month. Well, we had ourselves a right lovely evenin' in Knoxville's Golden Globe. Thursday night was the first of many of our Nights Out With the Wigshop. Robert, my wife, and Myself showed up at 7ish and the night got better. Three hours later, CK, Big B, Lo, and Brimer (our newest though yet to post writer) all made appearances. It was a night to remember and I want to tell everybody to go up there. The Skybox is fantastic. The drinks are delicious (I had a Strat-o-Sphere, ummm yummy) and the views are intense. Knoxville never looked so good. I'm gonna put up a couple of pics I took and hopefully some of the gang will add theirs on as well. So Remember go to the Skybox, in the Sunsphere ask for Barbara who is a fantastic server, and spend three or so great hours enjoying one of Knoxville's best bars. No Surprise, it get 10 Wigs in my book. Living in downtown Knoxville isn't really an option for me, so I'm really glad that the city does so much to make sure that those of us who want to come downtown for an afternoon or a night on the town at least has a place to park. The city just announced it's decided to waive the football gameday parking fees at the Market Square Garage and State Street Garage. This is good news whether or not you're interested in seeing Tennessee play. If your plans do include the Vols, KAT offers free shuttles from Market Square and the Old City to Neyland Stadium. That means you can hang out and have some pregame adult beverages at Preservation Pub (assuming the game ISN'T at 12:30 p.m. like it was last week), and not worry about driving/walking to campus. If football is the last thing you'd put on your itenerary, then take advantage of the ghost-town atmosphere of downtown Knoxville while the game is going on. You will never find an easier time to navigate the streets around campus and downtown as when 105,000 people are off the streets and packed into Neyland Stadium. I'm sure our city's fine merchants will especially thank you for your business during those slow times. The Vols play Florida tomorrow at 3:30 p.m. and Northern Illinois on Oct. 4 at 7 p.m. So I recently visited Knoxville's newest Japanese foodery, Magic Sushi. Located at 17th and Cumberland on The Strip, Magic Sushi occupies the infamous corner spot once home to Blockbuster Video, Ruby Tuesday and, most recently, The Cube. This paradoxical locale is the Bermuda Triangle of Strip residents, with each tenant only lasting a couple years. Why is this so? The location is arguably one of the best in the area, yet every business that sets up shop is almost invariably doomed to failure. I mean, who doesn't want to go to a sleek, modern club called The Cube ... on the Strip? The food was actually really, really good, and it didn't hurt my expectations that when we walked in, the Asian American Association was having a gathering there. Happy Hour is from 4 to 6, and includes select rolls (be sure to check out the Crab Cake Roll). Prices are average to just-shy-of-Nama territory, but then again, food, ambiance and service are all in that upper echelon. Give it a chance, and let's hope this one can break the curse. PS: There's still a club attached, so if you are one of the many who are missing The Cube, there may or may not be a foam party in the not too distant future. Last Saturday my sweet grandfather took me to the football game. We did not sit amongst the common folk. No. He had skybox tickets. I never asked how he got them. I'd rather not know. But he asked me to be his date and he didn't need skybox tickets to persuade me to go. My parents took my sisters and me to games growing up. We drove all the way from Memphis with our flag flapping in the wind. Everyone was so excited, and I was, too. I admit, it started as an adoration of the band. The Power T never ceases to make me weepy. Slowly my affections grew into actually paying attention to the game. I know exactly when to cheer. Most of the time. But every game thus far has been a preparation for my skybox debut. My grandfather and I sauntered up to Gate 26, a gate in itself that towers to the heavens. Everyone smiled at us, even the woman who checked my purse, a vast comparison to being corralled into the student gates. The elevator man pushed the button for us. The sports broadcast was humming out of the speakers. The doors opened, and we were there. A deep freezer full of ice cream, boxes of popcorn, a full buffet, coffee, soft drinks, and my favorite, one of the best views in the Knoxville. Each skybox was stocked with alcohol. I think that's supposed to be a secret. So don't tell. Each room was like a tiny glass theater, the stage being the field a mile below. The walls were glass so you could see everone all the way down in their little skyboxes. All I could think about was how much each of these people paid to get there- somewhere between $2 and 30 thousand? My only complaint was that I couldn't shake a shaker or sing Rocky Top without looking a little crazy. I sat in the air-conditioning, ate ice cream and drank wine for five hours straight instead- a close second. Even though we won, most people left disappointed. I sort of understand this sentiment, but then again, not really. The concept of fans getting upset over a win they had nothing to do with while sitting in a cool box sipping beer baffles me. My grandfather and I went down the elevator. My ribs hurt from eating too much, but I was happy. I decided to walk home to burn some calories. He kissed me on the cheek and I turned toward downtown, beaming. I can't decide if my blood runs orange or if it's something else. I can't imagine, though, living in this city and being nauseated by the color orange. It wouldn't be worth it to me. So I'll continue going to the games as a common folk, and as I eat my hot dog, I'll talk about how I wish more money would go to the arts program at UT. It doesn't make sense, I know, but neither does living here and hating UT. I was always a nail biter. It's a terrible, disgusting habit; but it was always my vice. After many failed attempts to quit, I finally kicked the habit for good about a year ago. Maybe my nails will never be the prettiest little things (working a very corporate job, it's easy to pick out the sort of manicured and maintained corporate lady with her matching jewelry and sweater sets; that lady is not me), but they are much nicer looking than they've ever been. I like to treat myself to manicures and pedicures. My runner's feet need some love. And my hands, well, they still need a lot of help. I'm not a fan of super posh salons where everyone whispers and feeds you relaxation elixirs. They make me uncomfortable. Nor am I a fan of mall nail salons, because you never know how clean they are or whether or not you'll lose a toe when you're in there. So I love Laura's Nail Salon in Bearden, because it is distinctly neither of the two things above. It's a cozy, friendly little salon in the same plaza that's home to a Subway and a cupcake boutique. At Mohican and Kingston Pike, it's right across the pike from new Nama. I just feel comfortable at Laura's. It's the sort of little place where you could strike up a conversation with anyone and everyone. Laura sets out bagels on Saturdays; I love going there on a Saturday morning for a light breakfast and a pedicure. She's also got very reasonable prices for such high quality services! Who doesn't love a deal? Laura is a small business owner whom I love and respect very highly. She treats her customers with the utmost respect; and she is genuinely concerned about their well-being. She is friendly and fabulous. She's a family woman; and you can tell the second you meet her. And her staff follows suit; those are some wonderful people down there at Laura's. If you're a runner, you will love Laura's. She's awesome with callouses! She understands that they're there for our protection...so she'll give your feet some love, but she won't file your skin away with that scary file thing! My friends and I are all regulars at Laura's; I think you should be too. That's right you're invite to the First Semi-Bi-Quarterly Wigshop Meet and Greet. Who: If you're reading this... YOU. We'd love a chance to meet some of our readers, get to know why it is you waste your precious time on us, and what it is you like/ love/ get really frustrated with about our little city. Give us a shout out if you can come... and of course you'll be able to recognize us by our special event dress, Imo-causal. You might have heard by now that our fair city is running head first into a gas shortage. Hurricanes Gustav and Ike have threatened refining operations along the Gulf Coast and now our local stations are running low on supply while the prices are quickly increasing ... I think they've gone up a quarter in the past 12 hours. Make sure you fill up your tanks now before Hurricane Volfans comes to town this weekend for football, increasing the demand. Or try parking the car this weekend and walking/biking everywhere you need. Has anyone been out to fill up this morning? What have you seen? I called the city to find out more about the trash in 2nd Creek where it meets the Tennessee River near Volunteer landing. They sent me on a wild goose chase of phone calls, but were all very helpful. My final call was to Fort Loudon Lake Association which is located right by Ruth’s Chris on the river (865-523-3800). Scott Wilson was very helpful and patiently answered my long list of questions. So the problem is a little troublesome: how do you stop people from littering all over Knoxville? Doesn't seem very promising, does it? Fort Loudon Lake Association does have educational programs and volunteer creek clean-ups. They are very short staffed and have a lot of territory to cover, not just the massive problem of 2nd creek. They rely on others to help them out. You can go to www.fllake.org to find out more information. In the very near future I would like to get a group to do a creek clean up. My comrades, ready your dipping nets. 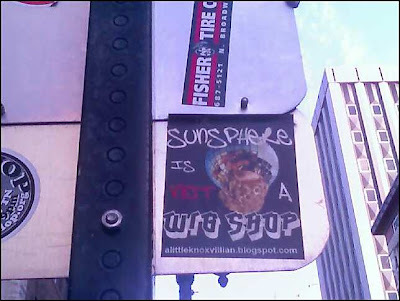 about 6 months ago ck put out some wigshop stickers. I finally found one. It's right outside of the brewery on the back of a street sign. I think we may need a new marketing director. here is the sticker, you can win a prize if you can find others. Operation Boot Camp of Knoxville is hosting a bring a friend day this Thursday. Get the details here. I would love to see some new faces out there! I met Jack Neely on Friday. Actually, I was never formally introduced to him, but I did see him, and I stood in close proximity to him for two hours. If you don’t know who Jack Neely is, go pick up a Metro Pulse sometime today. He is one of my favorite writers. Friday night was the Knox Heritage Art and Architecture Tour, where Knoxvillians were given a chance to see the city again for the first time. Jack was my group’s tour guide. I am not a natural reader. I love books and reading, but there is a daunting factor to the whole process, especially when I open up a newspaper or a magazine. The pictures usually distract me and I end up only reading captions. Some of my heroes are writers who entice me to read. One of those writers is Jack Neely. It is not only the tasteful way he puts words together on a page but also the subject matter he chooses. As the intern at Knox Heritage, I file away an endless sea of articles. One fourth of those seem to be written by Jack, and I read most of them. It has taken me months to do a task that would have taken a normal person a few days. On Friday night, I checked people in at Sapphire for the Art and Architecture tour. Of course, I was anxiously awaiting one man’s arrival, curious to see the face behind all of those “Secret History's.” And then, in the twinkling of an eye, there he stood. I couldn’t see his face at first because he was backlit, but I could make out his name tag. As my eyes adjusted to the light, I was delighted. Jack stood there, stylishly wearing white converse and a white button-up shirt with the sleeves rolled up. He had a cool smile and liquid blue eyes. He was twice my age. As we continued on with the tour, I was so busy looking at him that I couldn’t process most of what he was saying. He endearingly stammered over his words, lit up as he talked about an outlaw that walked across the Gay Street Bridge, and even toasted a wall of old bricks. I had to leave the tour early to go see a friend’s art show. For some reason I made the decision not to meet Jack before I left. I guess I’d like to still keep him a mystery. From what I did gather, however, I came to this conclusion: Jack Neely is Knoxville’s Indiana Jones. He does what he can to protect and preserve what makes Knoxville unique, even if he is only able to memorialize buildings that once existed with words. His whip (pardon the cheese) is his keyboard. I guess that makes me the girl with “I love you” written across her eyelids. Some people say that I have a GPS in my stomach. It usually leads me to particularly unhealthy food from my childhood. And based on the location my wife and I decided to live in knoxville, I must say they're entirely correct. The original freezo is basically the concession stand at the Doug Tew baseball fields where I grew up in South Alabama. At about the 7th inning, my stomach growled for cheese fries so loudly that we joked about it distracting batters when I played catcher.They've got corndogs and hamburgers and, by my account, an award winning frozen yogurt machine. I tried the chocolate dipped chocolate and vanilla swirl in a cone. If you're there at the right time, they've got peach shakes (see picture on the side). That's an ice cream fantasy if I've ever heard of one. If you're in the mood for a cheap thrill (or fantasy), head up Central Ave from downtown to their drive-thru just past Happy Hollow. Minor setback- the hours are tough for the working (wo)man, 11-5 on weekdays. But the main reason you should go to the freezo is that it's 100%, bona fide Knoxalicious. Continuing my series of photo posts no one seems care about (or comment on), I found this photo while doing research for the mini buildings I'm designing for Safety City. They wanted a 1/4 scale replica of the old Market House. 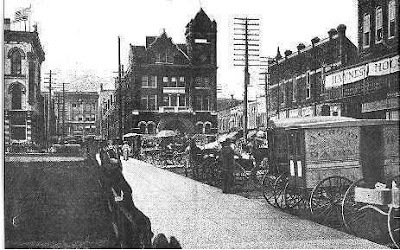 I'd known that there'd been a market building in the middle of Market Square, but I had never seen the old photos of it. It's awesome. Why did we tear it down?! I mean, I love the open plaza of the Square now, but this would've been really cool for Knoxville to still have. 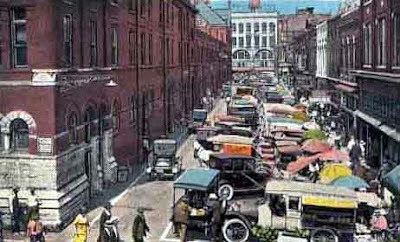 Just to orient you to the photo above, at the far left of the photo is the Kerns Building, where Market Square Kitchen is these days. This view is basically looking back up Market Street, from where Home Federal is now. Krutch Park would be to the right. The end we're looking at was tall, but the rest of it was like a big shed (similar to Charleston's Market) that people backed their wagons to and sold produce. The photo below shows the back part a little better. How cool would the Farmer's Market be if it was in this? Well, not to look a gift horse in the mouth, because don't get me wrong I loved Boomsday.... Whenever Henley street gets shut down and I can walk without fear from one side to the other is a good day for me. Also i have a fantastic vantage point looking down on Neyland and watching the world go by. I also was in a perfect spot for those phenomenal fireworks. The Chrysler Sponsor Area or whatever. They blocked off a huge chunk of the walkway and no one was there. It's a city park, meaning I pay for the upkeep. Not cool. OK, I get that sponsors should get a good spot because they spend a lot of money. That's fine. My problem was that they set up on the Riverwalk blocking people from a public thoroughfare. 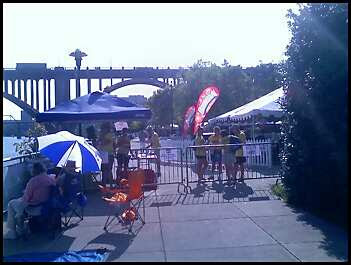 It kept the visiting public from enjoying one of the bonuses of Knoxville: our Riverside Park. OK, I'm not gonna rant any longer. It wasn't that big a deal probably- but it just irks me to see stuff like that. 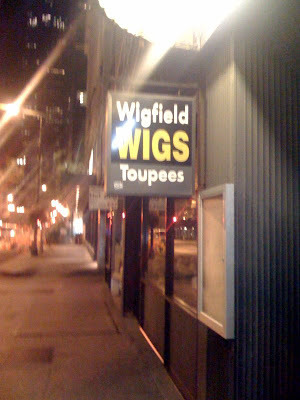 So I just got back from Chicago and don't have much knoxy stuff to share, but here's a crappy photo of something I saw there that reminded me of a little blog, 'cause it was weird and said wig on it.